Learn to read music notation by drawing. Multi-sensory workbook for children. Learning to read music is a difficult task but this new approach has been proven to work very well because it is so pictorial and enjoyable. Children love this workbook to the extent that they grasp the concepts immediately and want to keep exploring further under their own steam. Memorisation happens on a more practical level because note recognition is more easily matched to the pitch location on the instrument or instruments being studied. The physical act of drawing reinforces each note's position on the staff locks into the mind each mental image. The pictures have been selected very carefully to represent each note so that the picture itself indicates pitch. An example - treble clef high C has a crown picture because it is worn up high. The hand drawings have been made simple enough for easy and quick copying by the young student. Note that the drawing part of this book starts after Section One. Learn to Read Music by Drawing is cheerful learning at its effective best. 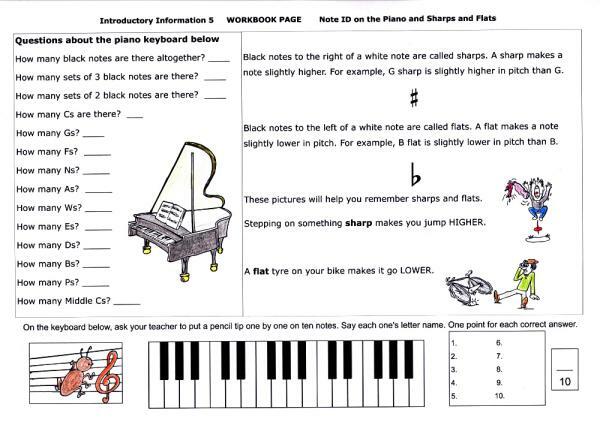 Section One - Introductory Information: treble and bass clefs, the piano note names, sharps, flats and note values. Section Two - Note identification uses drawing as the visualisation tool for memorisation. If I say the word 'sheep', a picture of a sheep comes to mind. The same principle of learning applies here. How many notes are taught? All line and space notes and up to two leger-line notes in both treble and bass staves have a copy-and-draw identity picture built on the semibreve shape. Children work at their own pace. Revision and assessment tasks are included. Includes GST and postage in Australia. Additional postage for orders from countries other than Australia.